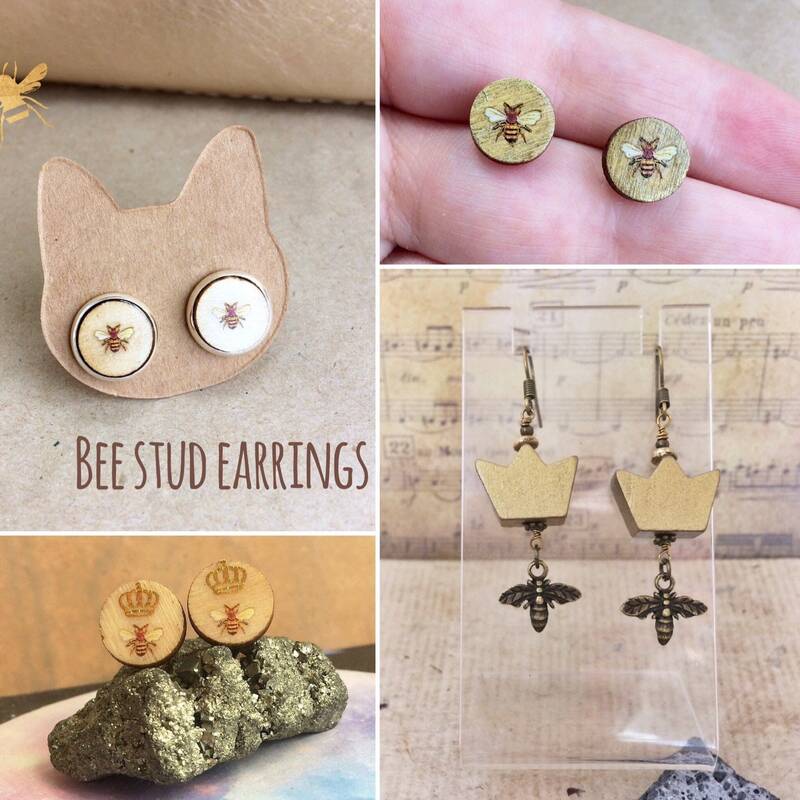 I'm Bey-Cray and expanding my range from the popular queen bee pair of Beyonce homage earrings to loads of designs! 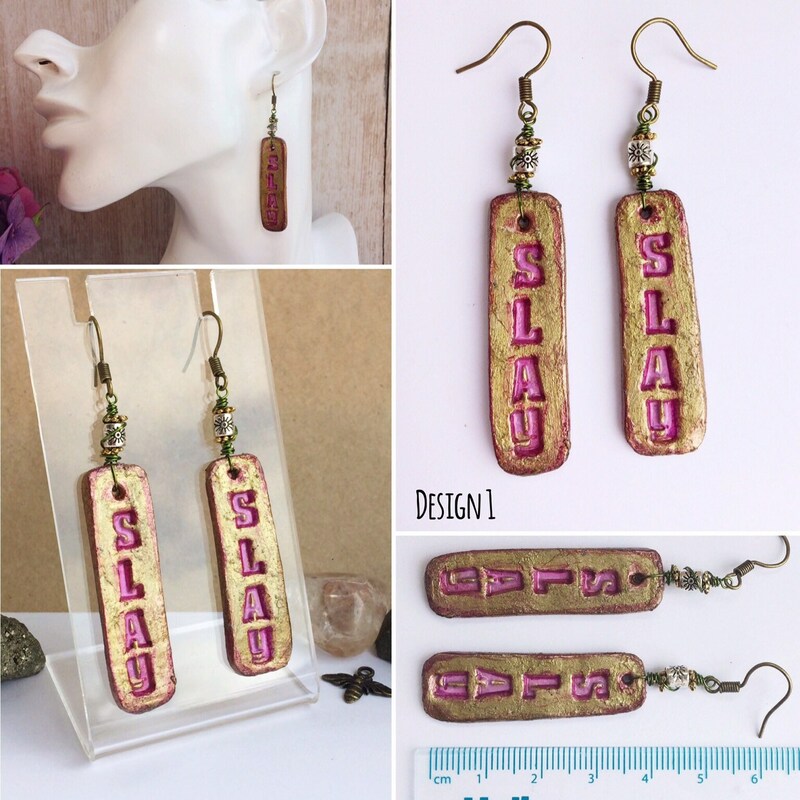 Here are several handmade earring designs, a series with handmade statement clay pendants. "I slay, okay, I slay okay. This pair has 'SLAY' from Formation imprinted. The letters are painted pink and the rest of the pendant painted gold. There is a silver coloured tribal eye bead, making 'I slay'. The pendants are approx 12mm wide and 44 mm long, with a thickness of 2mm. They are finished with metallic green wire and antique gold coloured ear hooks sized 18mm. This pair has 'SLAY' from Formation imprinted. 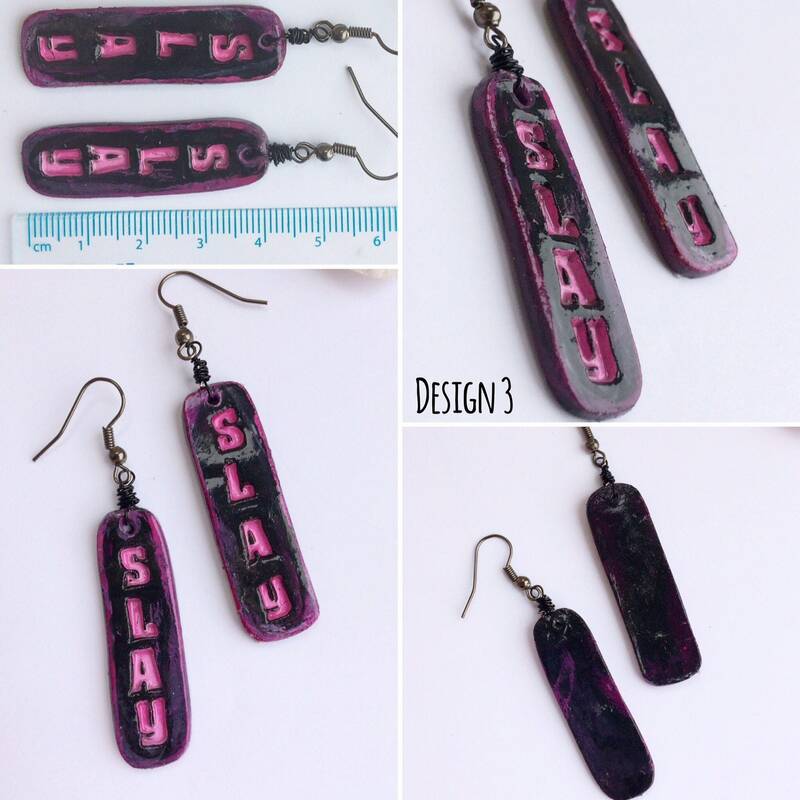 The eye charm makes it 'I Slay' :-) The pink and black colours are in reference to the Beyonce album cover and iconic FEMINIST performance backdrop. The letters are painted pink and the rest of the pendant painted black. The pendants are approx 12mm wide and 44 mm long, with a thickness of 2mm. The eyes are 27mm long and 9mm at the widest point. They are finished with gold coloured ear hooks sized 18mm. The SLAY motif in opposite Formation colours: The letters are painted pink and the rest of the pendant painted black. The pendants are approx 12mm wide and 44 mm long, with a thickness of 2mm. They are finished with black plated copper wire and matching ear hooks sized 18mm. 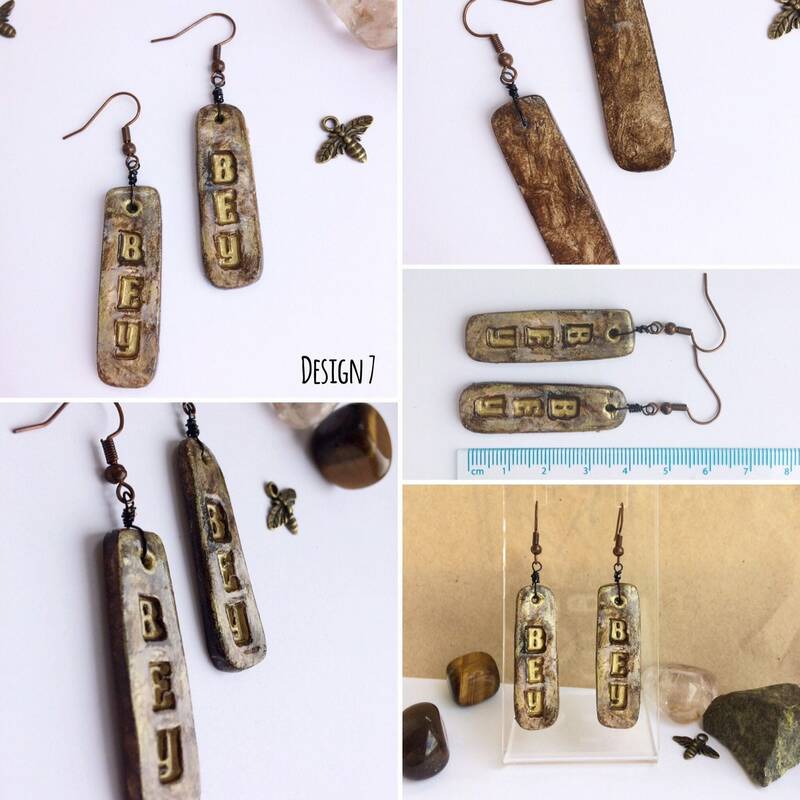 This pair has 'BEY' imprinted with the letters painted gold and the rest of the pendant painted in brown-gold. This is affixed to a wood crown pendant, making up 'Queen Bey'. The pendants are approx 12mm wide and 42 mm long, with a thickness of 2mm. The crowns are 1cmx1.5cm. This makes a total drop length of 6.4cm. They are finished with copper wire, antique gold findings and 15mm ear wires. 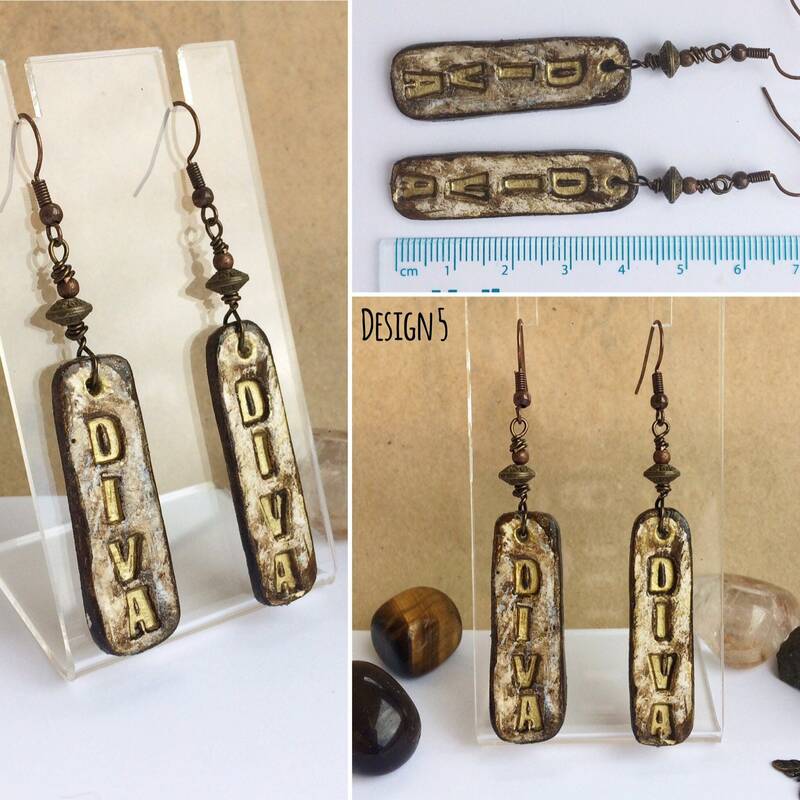 "Na, na, na, diva is a female version of a hustler ... Been the number one diva in this game for a minute"
Inspired by Beyonce's great anthem 'Diva', this pair have gold text on a brown/gold background. The pendants are approx 12mm wide and 40 mm long, with a thickness of 2mm. The pendants are complimented by an antique gold disc bead. They have a total drop length of 55mm. 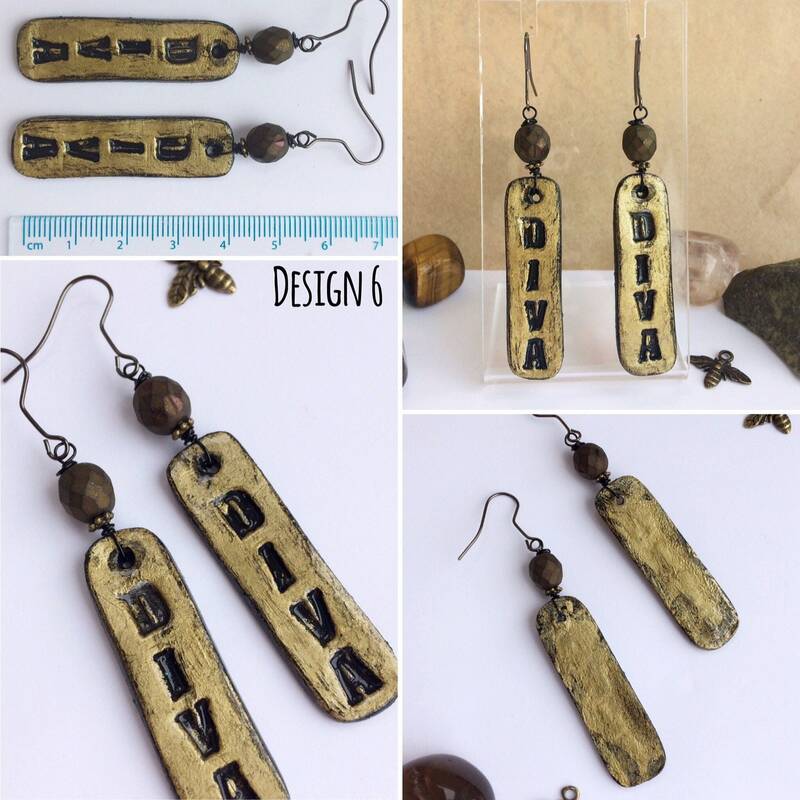 Diva with black text on a gold background. The pendants are approx 12mm wide and 40 mm long, with a thickness of 2mm. Complimented by a faceted pressed glass metallic bead. They have black earwires and a total drop length of 53mm long with bead. 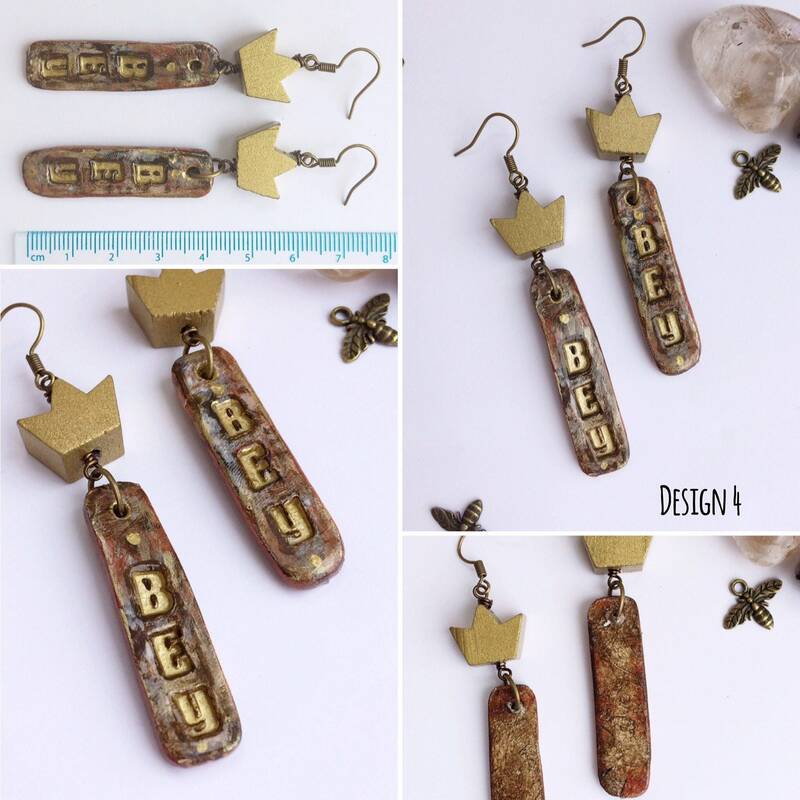 This pair has 'BEY' imprinted with the letters painted gold and the rest of the pendant painted in brown-gold. The pendants are approx 12mm wide and 37 mm long, with a thickness of 2mm. They are finished with copper wire, plated black and copper ear hooks sized 18mm. A quick note on materials and care: The pendants are made of air-dry clay and thrice varnished for protection (but please see care notes in my shop FAQ). 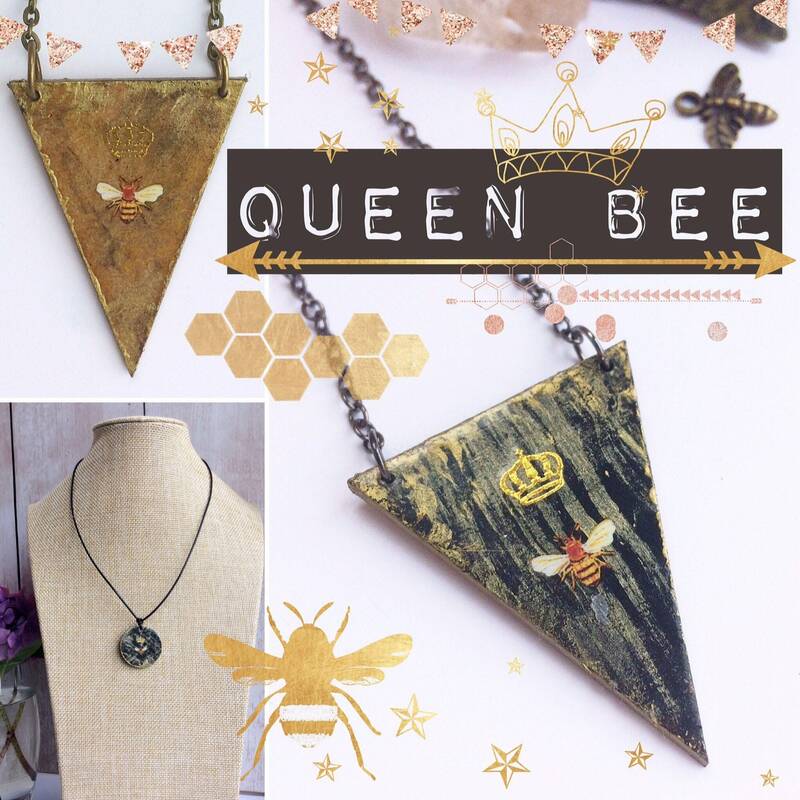 Because they are handmade, the pendants can differ slightly in size and shape to each other and I like this feature as it maintains the boho rustic aesthetic I always like to include in my jewellery. 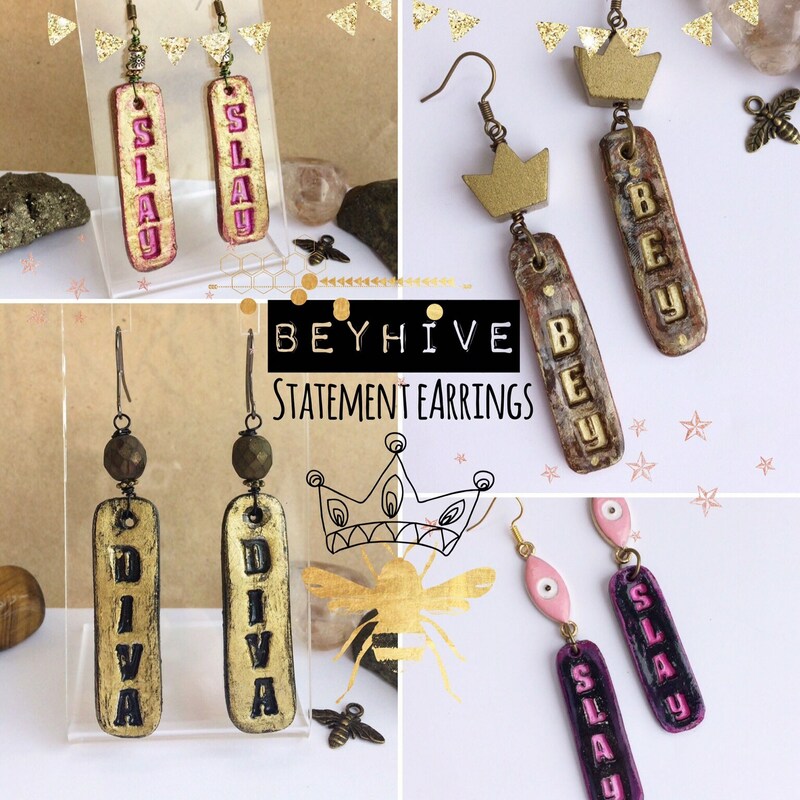 All the while celebrating our Queen Bee Beyonce in a unique, fun and contemporary statement piece! I think she would totally wear these!